Be sure that your organization’s website homepage or landing page has a clearly marked way for individuals to opt in for your emails or newsletters. An eye-catching opt in form is better than a “Sign up for our Newsletter” button that takes individuals away from your homepage to a new screen. Consider placing additional opt in forms around your website. Some individuals might be drawn to a form placed at the top of a website while others head to the footer for helpful information. Multiple opt in form locations gives more opportunities for point of entry. A simple contact sheet at checkout gives customers an additional option to opt in and stay in the loop with your organization. Smartphone users will often skip an online form on their phone if it it too lengthy or not optimized for small mobile screens. Keep smartphone users in mind when designing a mobile version of your opt in form. Some users would rather log in with an existing account, such as Facebook or Twitter, rather than create another username and password they have to remember. Make things simple and streamlined by offering social login to opt in to your email list. This entry was posted in Uncategorized on April 26, 2013 by Bloomington Chamber Staff. 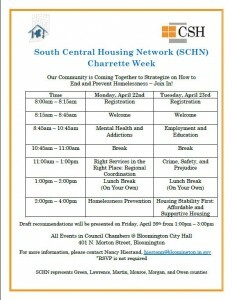 Our Community is Coming Together to Strategize on How to End and Prevent Homelessness − Join In! 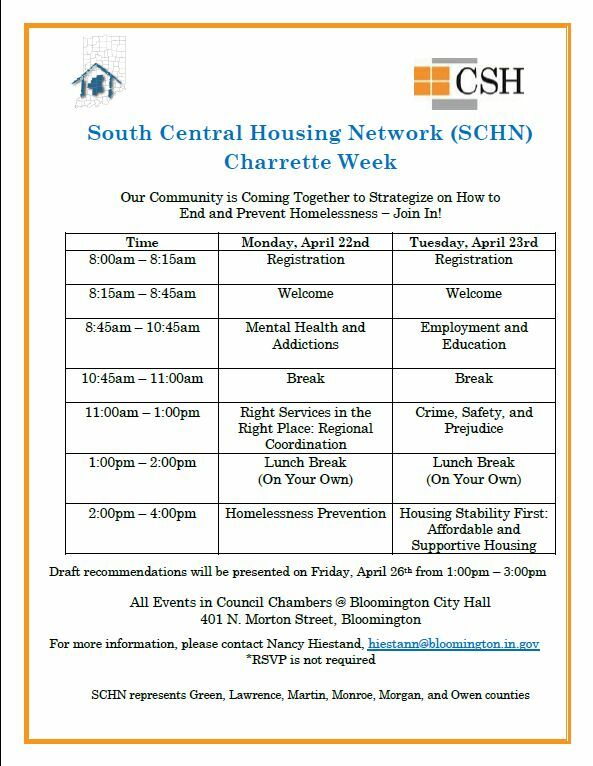 South Central Housing Network (SCHN) is hosting a Charrette Week. 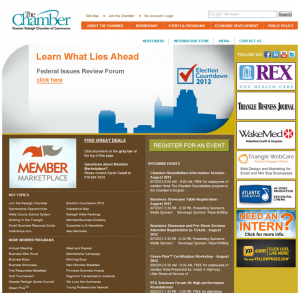 This entry was posted in Uncategorized on April 17, 2013 by Bloomington Chamber Staff. How to Use Pinterest: Tips from the Bloomington Chamber of Commerce. Start “Pinning” things you find “Pinteresting” on Pinterest! 1) Visit http://pinterest.com/ to join Pinterest. You can create an personal Pinterest account using an existing Twitter or Facebook profile, or with your email address. 2) Follow at least 5 boards on Pinterest. Browse categories from Animals to DIY & Crafts and Health & Fitness to Technology and select boards that look interesting to you. The more boards you follow, the more new and interesting content you will be able to see. 3) Confirm your email address with Pinterest. Check your email for a link to verify your Pinterest account and login information. 4) Start learning the basics of Pinterest. Pin – a single image or video that you share on Pinterest. You can pin images from around the web or upload images from your computer. Board – a collection of pins that relate to one another. You can have public boards, which anyone on Pinterest can view or secret boards, which are only able to be viewed by you. Follow – following someone on Pinterest allows you to subscribe to their pins. You can follow individual boards or every board a person has. Home Feed – the constantly updating visual list of pins from the people you follow. 5) Get your Pinterest Goodies. Pinterest offers apps on the Google Play Store and the Apple App Store. With the Pintrest app, you can pin things from your web-enabled laptop, tablet or smartphone. The “Pin It” button allows you to easily pin things you find on the internet by saving the “Pin It” button to your web browser’s toolbar. 6) Engage with the Pinterest community. Upload unique images that show what you or your organization can do, say or create. Comment on other people’s pins that you find inspirational or helpful. Repin content that you find interesting to your own boards. This entry was posted in Uncategorized on March 29, 2013 by Bloomington Chamber Staff. In history class I remember learning that the United States was known as a melting pot, however I have found this characterization doesn’t quite hold true in the workplace today. Do you believe your workforce matches the demographic you work in? If not, there are many benefits to developing a strategy to increase diversity. One tip to diversify your workforce is to ask current employees for referrals. They may have peers who are qualified for a position that needs to be filled. An additional source to use for connections is your community. Talk to local organizations, including cultural institutions and colleges. But don’t limit yourself to city boundaries. Utilize the Internet to expand candidate searches to other cities and states. Implementing diversity can also be rooted outside the hiring process. Provide training to employees on the equal opportunity employment policy your business has in place and how it affects them. Offering benefits to employees is another method to diversify your workforce. Some benefits include on-site daycare, flexible schedules and accommodations to religious holidays. As you make these changes to your business remember to be transparent to employees on why changes are happening, and the importance of a diverse workplace. This entry was posted in Uncategorized and tagged diversity, equal oppurtunity, workforce on January 15, 2013 by Bloomington Chamber Staff.